Pink Gold Cocktail Ring with Coloured CZ. 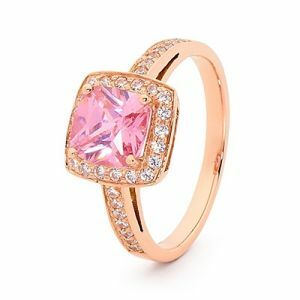 Beautifully feminine and very elegant this 9 carat rose gold ring looks stunning set with 34 brilliant Cubic Zirconia and a pink cushion cut sparkling gemstone. A ring to treasure. Gemstone: 1 x Cubic Zirconia CZ pink cushion cut 7x7 mm. Gemstone: 34 x Cubic Zirconia round 1.25 mm. Material: 2.9 x grams solid 9ct rose gold.